China’s smog problem has infiltrated haute couture. 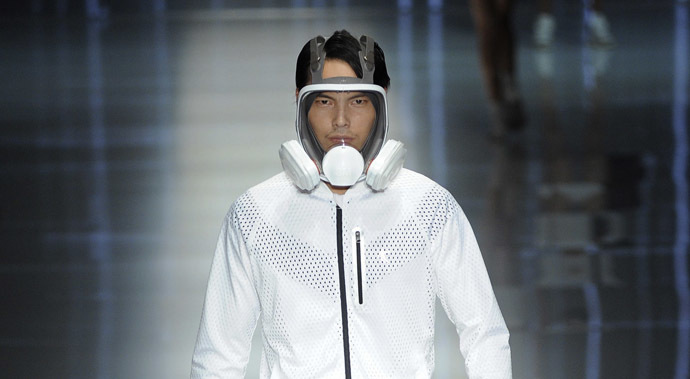 One fashion designer has embraced the country’s ongoing problems with pollution, incorporating the need for face masks into their Spring/Summer 2015 sportswear collection. Yin Peng’s collection was paraded at China Fashion Week, currently being held in Beijing, with models parading down the catwalk wearing face masks. The models looked determined not to let the conditions of the city in which the fashion show was held get to them. The masks varied from full-face cover, as with a fencing mask, to angular lightweight mouth-covering designs to compliment running gear. Calvin Klein Jeans | Fall 2014 Campaign. Calvin Klein Jeans | Fall 2014. The Fall 2014 Calvin Klein Jeans campaign is incredibly hot, featuring the gorgeous Lara Stone with an equally hot male model. Featuring some stunning looks for Fall 2014, the campaign is photographed by Lachlan Bailey.